Today we are announcing the Grand Prize Sketch Contest -- one lucky winner will receive a $150 gift certificate to A Cherry On Top! To enter this contest, create a layout based on any sketch of your choice from 2013 or 2014 on the PageMaps site. An archive of all of the sketches can be found HERE. You are encouraged to interpret the sketch any way you'd like, using any products of your choice. Email your submission to contest@pagemaps.com and include your full name, mailing address, email address, and the month/year of the sketch you chose. One entry per person. 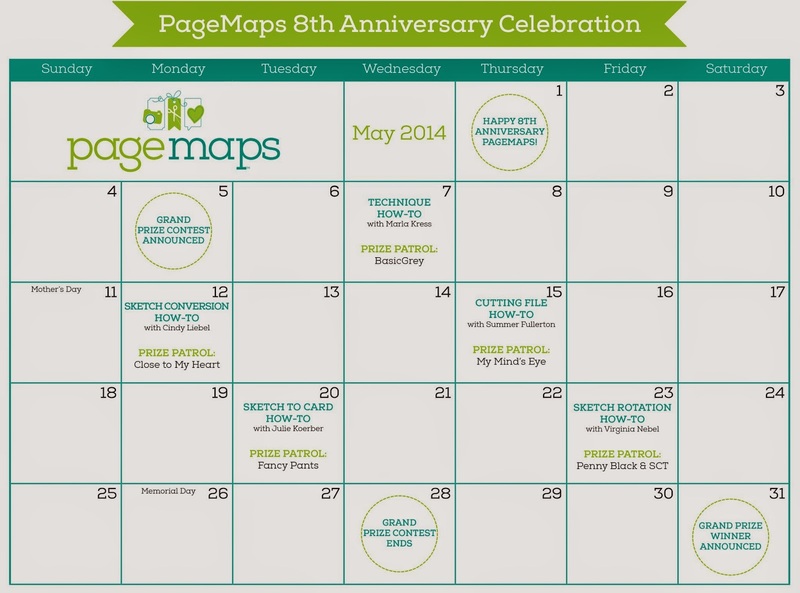 Visit the PageMaps Anniversary page for all rules. Contest ends midnight (MST) on Wednesday, May 29, 2014. Give-aways, challenges, how-to's and more begin this Wednesday so please stop by! Is there a deadline for submitting a page? Wow!!! I'm so glad I'm a stay at home mum, the cleaning can wait... I'm scrapping today!! Now the hard part... To choose only one sketch. What a fun challenge. Choosing a sketch will be so hard as you have so many grea t ones to chose from. Thanks for the info! I might have to try this challenge!! !